PRINCETON, N.J. — U.S. small-business owners are the most optimistic they have been in seven years, according to the latest Wells Fargo/Gallup Small Business Index. The index, at +71, has increased significantly for two consecutive quarters, and reflects optimism in small-business owners’ views of both their current situation and their expectations for the future. The latest quarterly Small Business Index survey was conducted Jan. 5-9, 2015. The overall Small Business Index score has increased significantly, from +58 in November and +49 in July 2014. While still below pre-recession levels, the index is the highest it has been since January 2008’s +83. The Wells Fargo/Gallup Small Business Index measures small-business owners’ views of their present situation and future expectations concerning their financial situation, cash flow, revenues, capital spending, hiring and credit availability. Small-business owners’ evaluations of their present conditions increased to +28, up from +21 last quarter. At the same time, the future expectations component continued to climb to +43, up from +37 in November. Both of these dimensions, like the overall index, are at their highest points since 2008. Small-business owners are feeling better about their companies’ revenues, with nearly one-half (49%) reporting that their revenues have increased “a little” or “a lot” over the past 12 months. This is a seven-percentage-point uptick from Quarter 4, 2014, and represents the highest reading on this measure since 2007. The survey shows a net positive hiring situation, with more owners reporting hiring over the last 12 months than decreasing their workforce. Thirty-four percent of small-business owners report that it has been easy for them to obtain credit, up from 28% a year ago. The current survey shows small increases in owners’ positive ratings of 11 of the 12 metrics comprising the overall index. 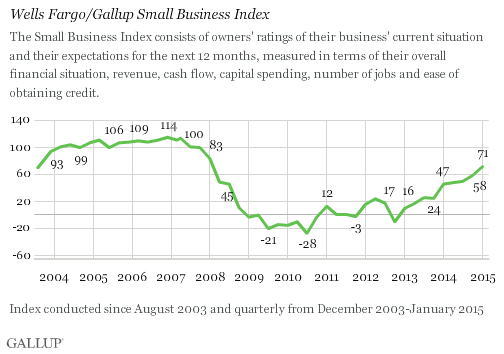 Small-business owners’ improving views of their revenues and other aspects of their businesses have propelled the overall Wells Fargo/Gallup Small Business Index to its highest level since 2008. This continues the general upward movement seen in the index since it reached its low point in 2010, although it remains below the high points registered in the years prior to the Great Recession. 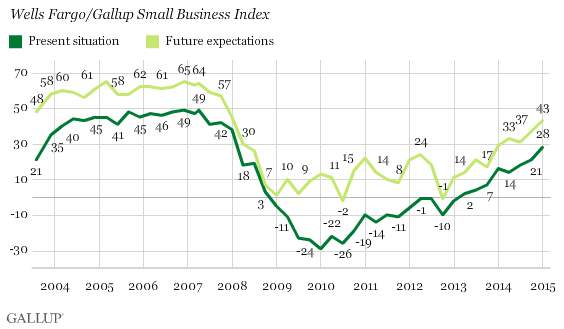 Small-business owners’ more upbeat views of their operating environments come at a time of generally positive economic trends in economic growth and unemployment, as measured by the government, as well as year-over-year upticks in Gallup’s consumer-based reports on employment, company hiring and consumer spending. Results are based on telephone interviews with 603 U.S. small-business owners in all 50 states, conducted Jan. 5-9, 2015. The margin of sampling error is ±4 percentage points at the 95% confidence level. All reported margins of sampling error include computed design effects for weighting. For more information about Wells Fargo Works for Small Business, visit WellsFargoWorks.com. Follow us on Twitter @WellsFargoWorks.